Astronomer and Queen’s guitarist, Dr Brian May has lent a rare collection of Victorian stereographic photographs to Tate Britain. They are featured in ‘Poor man’s picture gallery’: Victorian Art and Stereoscopic Photography until 12 April 2015. This is the first display in a major British art gallery devoted to the nineteenth-century craze of three-dimensional photography, known as stereographs, and open up this neglected area of British art. In the 1850s and 1860s pioneer photographers staged real men, women and children in tableaux based on famous paintings of the day, in order to bring them to life as three-dimensional scenes. Henry Wallis’ Chatterton 1856, William Powell Frith’s Derby Day 1857 and John Everett Millais’ The Order of Release 1746 are among twelve of Tate’s famous Victorian and Pre-Raphaelite paintings to be shown with their 3D hand-coloured photographic equivalents. Stereographs comprise two photographs of the same scene taken from fractionally different viewpoints. When these are mounted side by side and viewed through a stereoscope, the viewer sees just one three-dimensional image. Stereographs were inexpensive, and in the 1850s and 1860s they circulated world-wide in their tens of thousands. Many Victorians became familiar with well-known paintings through their stereoscopic counterparts which became known as a ‘Poor Man’s Picture Gallery.’ The photographs were regarded by many as fairly disposable, making them hard to track down today. The display introduces important figures in stereoscopic photography such as Alexis Gaudin and Michael Burr, and shows how some of their innovations also inspired painters. 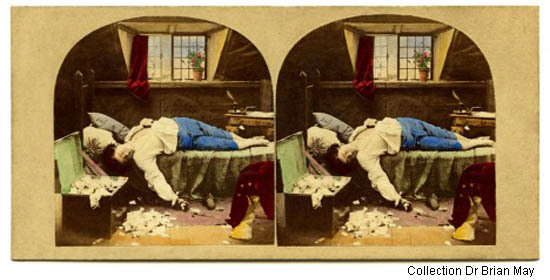 Burr’s stereograph Hearts are Trumps 1866 anticipated John Everett Millais’ voluptuous painting with the same title six years later, and James Elliott’s Derby Day, One Week after the Derby 1858, pre-empted Robert Martineau’s renowned oil painting of family ruin, The Last Day in the Old Home 1862. The photographs exhibited in this display at Tate Britain are kindly lent by Dr Brian May. This display has been curated by Carol Jacobi with Dr Brian May and Denis Pellerin. The book The Poor Man’s Picture Gallery: Stereoscopy versus Paintings in the Victorian Era by Dr Brian May and Denis Pellerin is published by the London Stereoscopic Company on 20 October 2014.